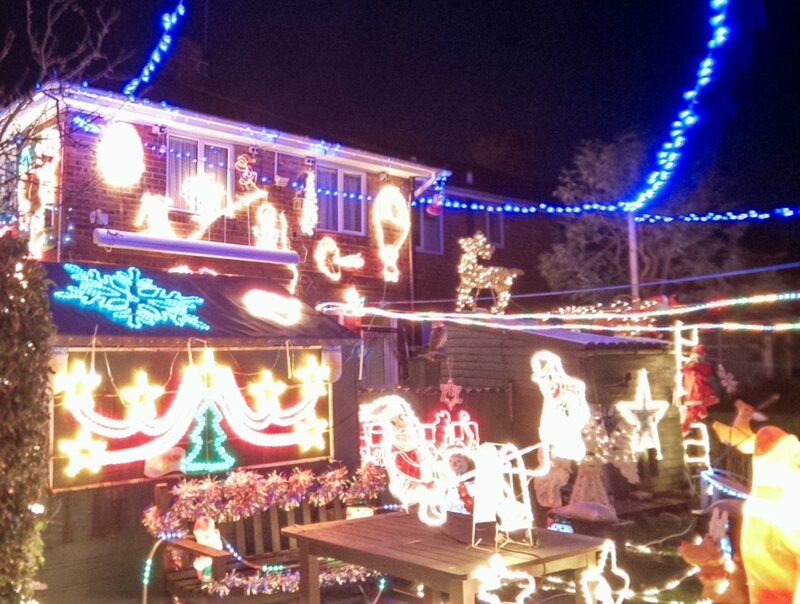 Last year, my parents moved house and at Christmas we realised that the owners of a nearby house decked their house out completely with Christmas lights. Not just their house, but the gardens and shed too, and all in the name of charity. We intended to take the children for a proper look, but events overtook us and it didn’t happen. This Christmas, no-one was taken into hospital (hurray!) and so we did get to go and see the lights today. The children wore their new coats and hats and gloves (and a huge thank you to Stonelaughter’s brother for the gift of mittens on a string for Plum and PK neither of them lost a glove on this trip!) and we set off. 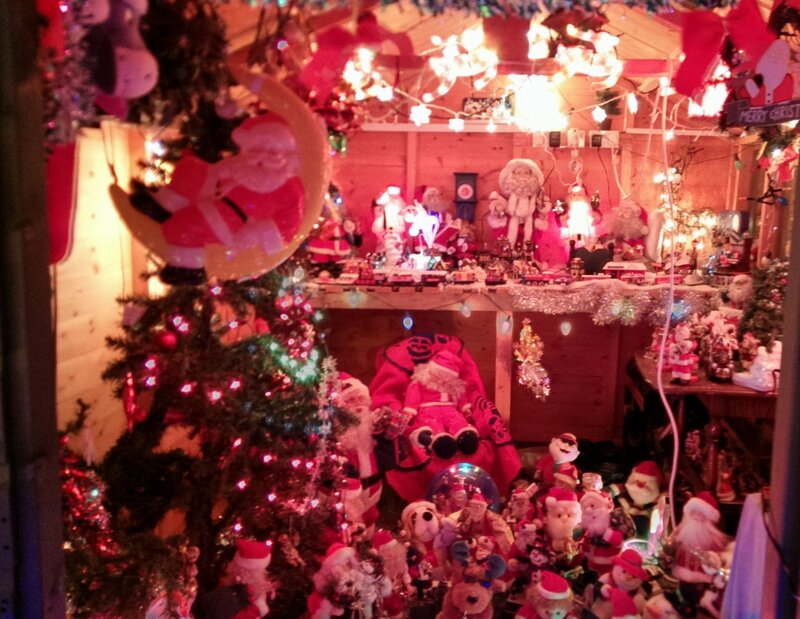 It was only a few minutes’ walk away and there was so much to see a huge variety of lights, and the shed was decked out like a grotto, and the attention to detail was unbelievable – at the back, where you might expect less effort, there was a miniature train and an ice rink with moving figures. We tried to count how many Santa lights we could see, but we soon gave up – there were far too many! Ordinarily, light displays like this just annoy me (and when we lived in a house where the two neighbours were at war with each other to see who could have the biggest/most/best Christmas lights on their house it was awful! ), but this was all in aid of the Yorkshire Air Ambulance, so I was glad to go and look and for the children to put some money in the collection box. 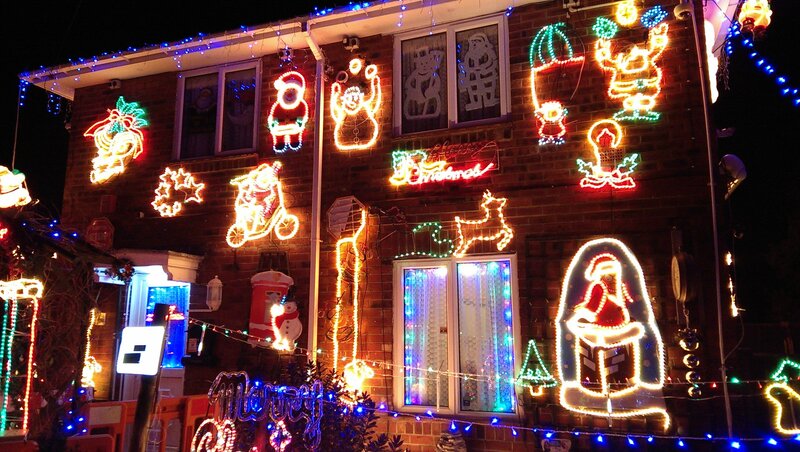 I hope the couple in question manage to raise lots of money (but I wouldn’t like their electricity bill! ).